Interested in going further in calculus but don't where to begin? No problem! With Advanced Calculus Demystified, there's no limit to how much you will learn. Beginning with an overview of functions of multiple variables and their graphs, this book covers the fundamentals, without spending too much time on rigorous proofs. Then you will move through more complex topics including partial derivatives, multiple integrals, parameterizations, vectors, and gradients, so you'll be able to solve difficult problems with ease. And, you can test yourself at the end of every chapter for calculated proof that you're mastering this subject, which is the gateway to many exciting areas of mathematics, science, and engineering. 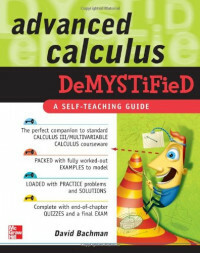 Simple enough for a beginner, but challenging enough for a more advanced student, Advanced Calculus Demystified is one book you won't want to function without!